Is it possible to live one’s own life vicariously? I’ve spent the last couple of weeks reading the summer’s blog posts and watching/listening to/reading all the links. What a summer! I guess you call that reminiscing, or nostalgia, not living vicariously. (Did I really do that?) Anyway, I’m itching to get back on the road. Anybody want to take me to New Zealand or Australia for the winter (here)/summer (there)? I’m ready to ride. My daughter showed me this video yesterday. I hope the tandem cyclists from our summer trip see this. Bicycling magazine used to have an annual contest to win the bike of your choice. You had to do or write something for your entry. One year was “Baikus”, short poems about bicycling, though they did not have to follow the formal structure of Haiku. I sent two entries: one called “First Ride”, about my daughter’s first ride, when I let go of the saddle and watched her ride away; and another called “Last Ride”, about my imagined last ride resulting in death from massive heart attack while riding down a mountain road, found with a smile still on my face. In the poem I would be, like Jiminy Cricket, 93. Hats off to Graeme, Betty, and Robert! May we all continue doing what we love for as long as we love it. I’d rather be alive than dead right. Sometimes the law is on your side but you’re still dead. So we’re going to talk about the law but also about staying alive. I know some stupid bicyclists and I know some old bicyclists. I don’t know any old stupid bicyclists. Generally speaking, you are safer on a bike if you operate it more like a car than a toy. You are generally safer if you operate in a predictable manner. We’ll go into some examples of those. In Wisconsin, a motor vehicle passing a bike is required to allow at least three feet of space. In many states (including Wisconsin), a bike is required to stay as far to the right as practicable. This does not mean “as possible.” You don’t want to ride in the “door zone”. Riding in the door zone either means you get hit if someone opens their door or you end up swerving in and out of traffic. In the picture you can see that only the very far left edge of the bike lane (if that) is a safe place to ride. Safer in this instance is in the traffic lane. Alternatively, you can ride while looking through the rear window of every car to see if someone is in it and might suddenly open a door. That was easier to do before the advent of tinted glass. (And you still need to watch everywhere else.) Bike lanes, to be safe, need to be outside of the door zone. Bob Mionske, writing in VeloNews, goes into this in more depth. What does operating like a motor vehicle look like? If you’re going to make a left turn, signal your intention, change into the left lane, and make your left turn from the left lane. A left turn from the right lane is not expected. If you’re going straight and traffic is turning right, don’t ride to the far right of traffic, get into their lane. That way they don’t turn right into you. Sometimes we forget where roads come from. Paved roads arrived primarily through the work of the “Safe Roads Movement” of the League of American Wheelmen in the 1890s. 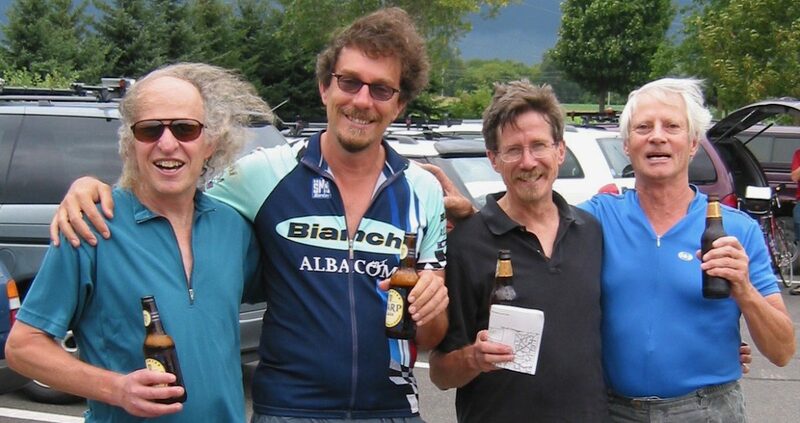 (The organization is still around but is now the League of American Bicyclists or Bike League. Wisconsin has long been known for its great system of secondary roads – why? Because family dairy farms were on those roads and the milk trucks had to get to them to make pickups in any weather. Now that the dairy industry is consolidating into fewer and larger farms, Wisconsin’s secondary roads are deteriorating. Bike path or road? Most bike paths are actually “multi-use paths” or “shared-use paths“. They are intended for bikes, walkers, joggers, rollerbladers, sometimes horses, strollers…If you are riding closer to the speed of walkers you are probably safer on a multi-use path. If you are riding closer to the speed of a motor vehicle, you are probably safer on the road. The walkers are safer with you on the road, too. Be visible and make noise. I wear bright clothing. I have a bell on my bike. I find it is most useful on shared-use paths. Calling out “on your left” doesn’t work very well. Hearing the word “left” makes many people swerve to their left. The sound of a bell seems friendlier than yelling and people can usually place the sound. If it’s coming from their left, they move right. See above re: speed. If you’re on a shared-use path and there are walkers, ride more slowly than you would on a street or empty path. With cars, a bell is seldom loud enough and it doesn’t carry a sense of urgency. When a car is running a stop sign into my path, I loudly yell, “STOP!” That seems to have a better effect. Plus I don’t have to get my thumb to the bell and I can use my hands to avoid the car (by steering and/or braking). By ambiguous situation, I mean things like: when two vehicles arrive at a stop sign simultaneously (at right angles to each other), the law requires you to yield to the vehicle on your right. Otherwise, whoever got there first has the right of way. If it is not clear who got there first, a gesture clarifies intent. The right of way is something to be yielded, not something to be demanded. Notice there are no “assert right of way” signs, but there are “yield right of way” signs. I thought I was going to put a bunch of diagrams of potentially dangerous situations in here. Others have done that. One example is: https://bicyclesafe.com. What else can you do? We (my family) are members of AAA, ostensibly for the emergency road service. But that also means we are contributing to an advocacy group for motor vehicles. I decided to at least equal that donation with donations for bicycle advocacy. The Bike League is a good place to start. Most states have an organization. In Wisconsin, it’s The Bicycle Federation of Wisconsin. Some places also have local advocacy organizations. Spend at least as much to advocate for your rights as a bicyclist as you spend for your rights as a motorist.